The administrative team handles many significant aspects of the RoboLancers. They compile data from the individual teams that will later be documented in the engineering notebook. Human resources, demographics, and and documentation such as waivers, permission slips are reviewed and filed. Additionally, the administrative team is also responsible for co-planning the robotics expo and conducts the oral presentations during competitions and events such as expos and fairs. The CAD (computer-aided design) team creates a chassis for the robot. Additionally, the team makes mock-ups of the robot and its parts in 2- and 3-D to create a visualization of how each piece of the robot fits together, and how the robot would hypothetically work. The RoboLancers spend, on average, $20,000 a year. In order to pay for our tools, materials, and registrations, the financial/fundraising team organizes fundraisers and looks for individuals or companies interested in sponsoring our team. The electrical team’s responsibility is to find the most sufficient way to utilize the electrical components provided. This requires collaborating with mechanical design team, since the use of these various components may change along with the mechanical design process. The mechanical systems team is responsible for designing and constructing the robot. Students look at the available resources at hand, discuss goals and how they can be accomplished, work in individual groups to create designs, and finally come together to create one collective design. After the design is decided, the team creates various prototypes to test the efficiency of their ideas. Advanced tools and machinery such as dremels, drills, miter saws, jig saws, and drill presses are used to construct their prototype. The prototypes are built simply by what they need, therefore it is necessary for the team to check and make sure that measurements are precise. Because a professional level of expertise is required for designing ideas and handling tools to put together prototypes, more experienced members of the team, and sometimes alumni, often assist new members. The programming team collaborates with the mechanical team to write lines of code that essentially order the robot to perform particular tasks. Each task that the robot will perform is set for a specific button or joystick on the controller. The outreach team is responsible for marketing and advertising the RoboLancers. Our main purpose is to inspire other students and communities to get involved with not only our team but robotic engineering as a whole. 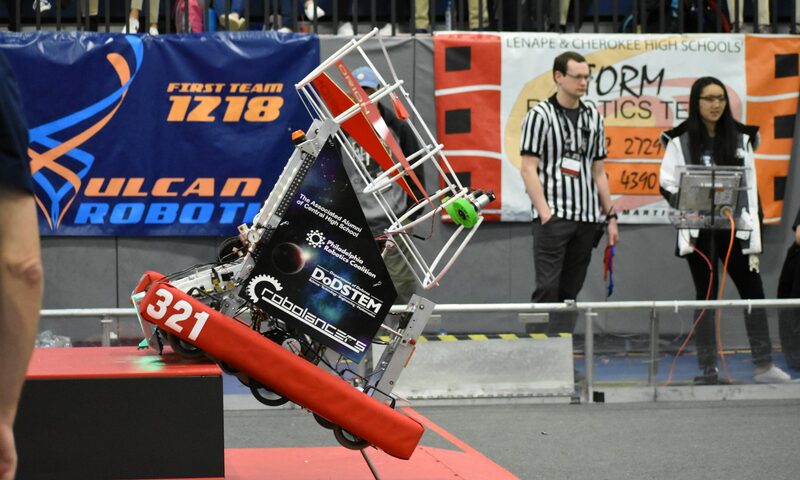 Students attend and run robotics events, including the Robotics Expo and various school events in which they educate others about competitions and projects which they are involved in, and any upcoming events in the future. The RoboLancers are responsible for everyone’s safety. Before engaging in any hands-on work, members are given proper tool training by students who have had more experienced with utilizing the tools. Everyone is required to wear safety goggles and must use tools and machinery with caution. Members keep an eye on each other to ensure that everyone is handling the tools appropriately and with caution. The website team is responsible for communicating information about the team to others via the internet. The RoboLancers currently have two websites:robolancers.com and expo.robolancers.com. Our flickr, Twitter, Facebook, Youtube, and Google+ sites are integrated into our main website. For the FTC competition there are two sub teams because of late we have so many people. Each team has its own separate members for each of the aforementioned groups, accept for Outreach, Fundraising and, Administration these are handled as a whole by members from each team Crimson and Gold.